The Old Northwest Notebook: A War of 1812 "Gatling Gun"
A War of 1812 "Gatling Gun"
The age of modern firepower was heralded by the introduction of the Gatling Gun, a multi-barrelled repeating gun. During the American race to produce arms for its smaller army and navy for the war with Great Britain, many inventors came up with new experimental weapons for the war. One of the most obscure but perhaps most powerful of these was the multi-barrelled Chambers Gun, patented by its creator gunsmith Joseph Chambers in 1814. Before the key components of modern repeating firearms were developed (the percussion primer and the all-metal cartridge, although these were combined to make a modern gun as early as 1812! 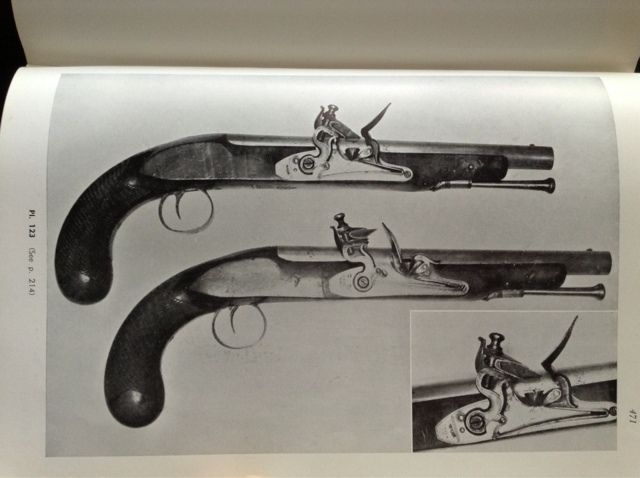 ), many inventors attempted to build multiple shot firearms. They mainly used two methods: multiple barrels and multiple charges in the same barrel. The first method is self-explanatory, but the first requires some explanation. When you load a muzzleloader, it's usually bad news to have more than one round in the barrel. Most explosions or failures in the gun barrel result from the difference in pressure created by having another object in the bore. Double charging is thus a recipe for making your gun into a handheld pipe bomb. Gunmakers from the 14th century on, though, sought to turn this tragic mistake into a useful weapon. They learned how to carefully load powder charges and bullets on top of each other. With a tightly-fitting round ball, the explosive energy of the top charge behaves as if the second ball were the breech. Then, either a second priming pan and touch hole are activated or the second charge is set off with delayed effect, kind of like a roman candle. That these kind of weapons were never popular is a sign of how dangerous and inconvenient to use they must have been. There was simply no advantage of having a repeating firearm that made the laborious loading procedures and expensively crafted mechanisms worthwhile. A small bore artillery piece charged with grapeshot or canister could get the same effect, and could be reloaded much faster and with less care. Joseph Chambers' inventions were developed for the US Navy during the War of 1812. His centerpiece was the powerful swivel gun, a seven-barreled .75 caliber gun that could fire 224 shots. The shots came out of the seven barrels in sequence, so that the infernal machine could be mounted on a frigate's fighting top and swept along the decks. What was the secret of the Chambers gun? Basically, the seven barrels were fixed together like a Gatling gun. Each barrel was loaded with multiple charges of powder and round balls. These balls are much closer to the actual size of the bore than musket balls, and are also patched with an animal membrane. Each has a hole bored through the center containing a small amount of priming. No wonder Chambers sent his sons along with to the US Navy to act as technical advisors-- any misloading of these guns would certainly have resulted in disaster! The first charge is set off by a flintlock set about halfway down the gun, connected to a trigger by a long wire. When it fires, the first charge sets off the priming leading through the second ball in the bore, and so on. It also communicates through a vent to a second barrel, to start off it's sequence of charges, and so on. The genius of this firearm is that it takes advantage of the natural delay between the priming and charge going off in a flintlock weapon. However, because of the precision demanded by the narrow windage and tolerances, this was a single-use weapon in a battle. The idea was that after several of these guns fired, there wouldn't be anyone left on deck to shoot at. As a bonus, they could be loaded and stored in advance during a long cruise, and unpacked for quick service. By the war's end, many frigates carried several Chambers guns in each fighting top. Although there is no direct historical accounts of them being used in a close action, some sources claim that a large number were produced during the War of 1812. As a specialized but powerful weapon, it is small wonder few if any of them saw combat service. The swivel gun, middle. From D.R. 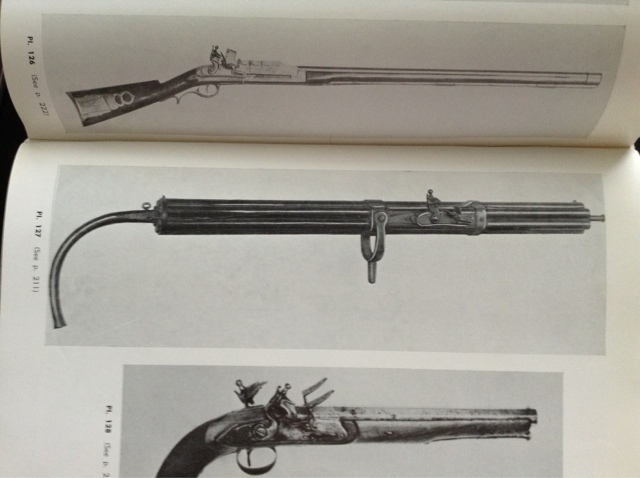 Baxter, "Superimposed Load Firearms, 1360-1860". 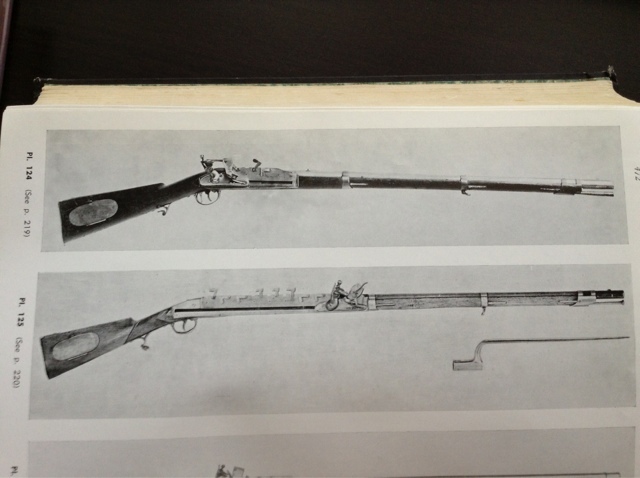 Two types of repeating rifles.